Background/Info: American artist ‘Mordacious Mortem’ has already been active for numerous years and can look back an impressive discography. After a few early releases on the defunct Hypervoxx Recordings/Telegrammetry Recordings and multiple self-releases Mordacious finally signed to Infacted Recordings releasing 5 full lengths. 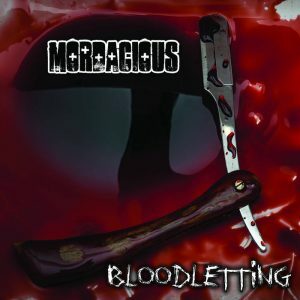 “Bloodletting” seems to announce a new era as it again is a self-released production although promoted by X-Beats (promotion company of Jan Loamfield from Noisuf-X, X-Fusion, Stoppenberg) who did the mastering as well. Content: The sound formula of Mordacious has never really changed. 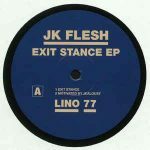 This is pure dark-electronic music carried by stumping rhythms, haunting vocals and constant horror-like melodies. The songs are quite recognizable, sometimes inspired by Suicide Commando, but in the end clearly revealing a very own sonic identity. + + + : If you’re into dark-electronics and you like dancing in clubs, Mordacious will be good company. The album is punchy and characterized by endless melodic sequences. Even if I’ve never been a huge fan of this band I have to admit the sound is quite recognizable. Mordacious clearly sounds inspired by some dark-electronic legends, but injected a very personal melodic touch, which always reminds me of the famous tune of “The Addams Family”. – – – : The sound formula of Mordacious has never really changed. The album becomes rapidly predictable and the songs repetitive. I however have to admit that the global production (writing, mixing, mastering) has been seriously improved throughout the years. Conclusion: Mordacious invites you to dance and go wild on dark-electronics. There’s no real challenge and not a lot of surprises, but it can works if you already enjoyed previous releases. Best songs: “God Of War”, “Awakening”.